The choice is clear - With the TEZ 8, Appion brings innovative, advanced technology to the vacuum pump. Designed from the ground up, the TEZ 8 combines performance and reliability with user friendly features to save you money. With the introduction of the TEZ 8, vacuum pump oil management has become simple, thanks to TEZOM technology (Totally EZ Oil Management). 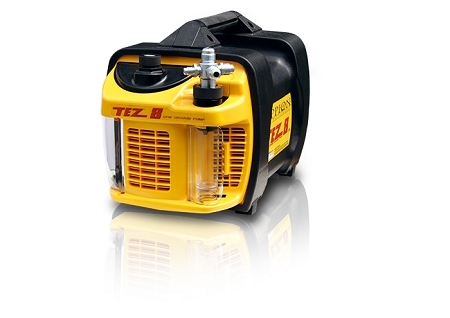 The replaceable TEZOM cartridge is the oil supply and oil sump all in one. The TEZOM cartridge is clear, making it easier than ever to monitor the condition of the oil, and you can change cartridges in about 5 seconds. Dirt moisture and sludge trapped in the TEZOM cartridge is removed when the cartridge is changed. This helps you ensure that your vacuum pump is always pulling a rapid, deep vacuum. 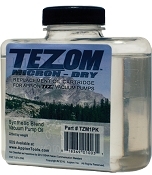 TEZOM oil is also extremely hydroscopic aiding in moisture removal. Because the TEZOM cartridge is extremely visible it is also very apparent when moisture is removed as the oil will turn a milky white. Unlike other, oil-cooled pumps, the TEZ 8 is air-cooled by a custom high-speed turbine fan blasting cooling air over the entire assembly, eliminating the need for excessive oil capacity. With so much cooling power, the pump runs cooler and lasts longer so that high ambient environments (rooftops, hot mechanical rooms) will not slow this unit down, and the case stays cool to the touch making handling safer and easier. 1100 TruReward$ points will be placed in your account when you buy this item.